Through its rich and diverse heritage, Cockatoo Island manages to encapsulate several different histories within the confines of its shores and has developed and its own unique purpose due to having such a multifaceted identity. While the conservation of the island is integral for us as the public to understand the history of the Sydney Harbour, the island has also developed a new, renewed purpose in facilitating contemporary installation art for special events. The past of Cockatoo Island carries several different intertwined histories, each influencing the architecture of the island in a particular way. Initially, the island was used as a convict settlement, which then evolved into a girl’s reformatory with these earlier buildings using stone quarried from the island itself. The shipyards later added to the evolving landscape of the island, facilitating a demand for architecture that was vast and industrial in order to cope with the nature of the work undertaken. This period lasted from the early 1900s up until the Shipyard’s closure in 1991 (Sydney Harbour Federation Trust 2017), the island developing a variety of industrial architecture throughout time. When the island reopened in 2007 its purpose was much different, allowing the public to experience and educate themselves on the island’s history though experiencing the diversity and atmosphere of the spaces themselves. It also became a space used by the Sydney Biennale, the event utilising the vast interiors of the shipyards and the characteristics of various areas of the island with the aim of “exploring how we perceive reality in our increasingly digitised era” (Biennale of Sydney 2016). These ideas of the relationship between space, physicality and experiencing alternative realities can be seen in the works during the biennale – and example being Chiharu Shiota’s installation “Conscious Sleep”. 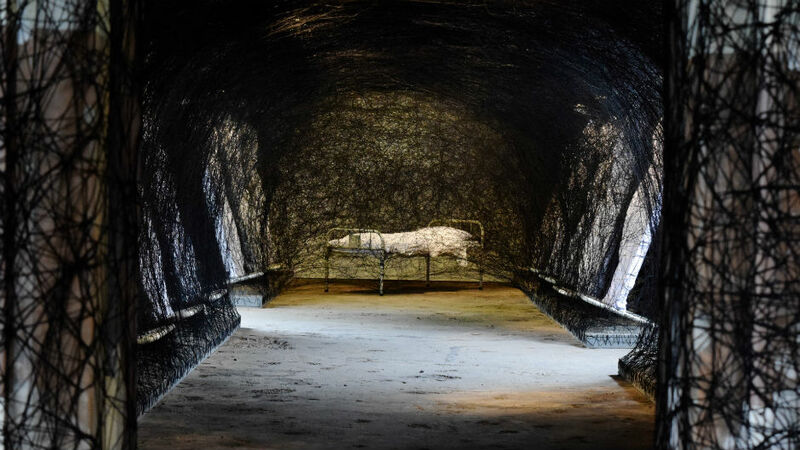 The work, pictured below, draws on the island’s heritage as a convict prison and girls refuge, the beds intending to “evoke notions of dreams, sleep, and memory, while the knotted threads can be read as bundles of nerves connecting the conscious mind to the world of dreams” (Forrest 2016). The work is a manifestation of both the artists own context combined with the complex heritage of the island, creating a work that forces us to actively engage with the immediate environment in a critical way. Figure 2: Chiharu Shiota’s Conscious Sleep (ABC 2016). Site specific installations are said to “shift the world around us, creating unfamiliar terrain in our everyday surroundings while forcing a reconsideration of history in light of the present day” (Frock 2014). With the Biennale being housed by the island since 2007, the site-specific installations held on the island have facilitated a more critical understanding of the heritage of the island. Cockatoo Island can therefore be used as a model for future reinventions – giving us an understanding as to how we can transform dilapidated, yet historically rich spaces into ones that encourage artists to build on that history to create engaging and provocative works. While the circumstances and history shaping Cockatoo Island are certainly different to those we will encounter in Singapore, the transformation of the space from a derelict industrial shipyard and prison into one that provides an immersive, critical understanding of the island’s history can be a catalyst for future ideas we explore, especially regarding how we can both preserve the heritage of a space while reinventing it for a new audience. thirteen days in singapore Blog at WordPress.com.